Prep Day: Preheat oven to 325 degrees F. Butter 8x8x2-inch baking dish. Peel and slice potatoes (about 1/4-inch thick). Place layer in baking dish; lightly season with salt and sprinkle with some garlic. 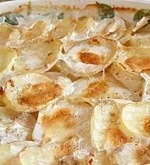 Repeat layering with remaining potatoes and garlic. Pour milk evenly over potatoes. Bake, uncovered, for 45 minutes. Remove the cover, drizzle cream over potatoes, then return to oven and bake 45 minutes longer (uncovered). Cool, cover snugly with foil and freeze until needed. Serve Day: Microwave until heated through.